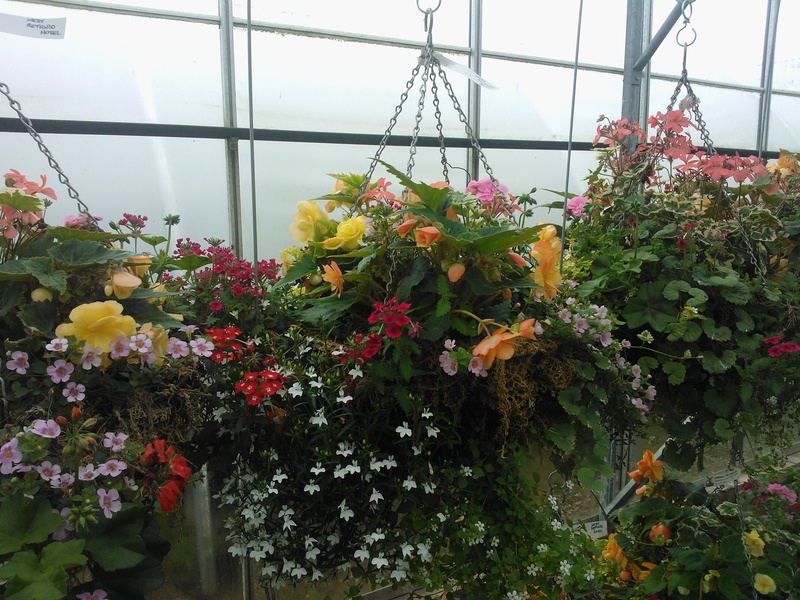 We start filling summer hanging baskets from mid April and they are ready to be bought 'off the peg' from May onwards. We use fresh moss in our wire baskets, which range from 12" up to 18" diameter, and we also fill a large selection of wicker cones and round baskets in sizes ranging from 12" to 16". Alternatively you can order a basket of your choice to the colour you require. Winter baskets are available from mid September, filled with a colourful mixture of pansies, heathers, ivy and small shrubs. We start refilling from mid April onwards, simply bring in your basket(s) and we will measure them and give you a quotation. Our price is for plants, compost, liner, filling the basket and hanging it in our greenhouses for anything up to six weeks depending on how early you bring the baskets in. We can do colour themes, or mixed colours, and we can do matching baskets or all different, whatever you fancy! Simply tell us and we will do the rest. Winter refills don't need the same growing time so can be brought in one day and collected a couple of days later. We have been delighted this year to once again refill the hanging baskets for the Best Western West Retford Hotel, as well as supplying baskets to the Bad Apple Cider Bar in East Markham. We have also supplied all the hanging baskets for the Retford in Bloom and Harworth in Bloom schemes this year, 75 of them, and they have been proudly displayed all summer above shops and businesses in the town centre. Filled and grown on by us, and maintained by Acer Landscapes Design and Construction Ltd. We have also supplied the baskets and troughs for the new crematorium at Barnby Moor. We are happy to deliver trees or larger shrubs directly to your door, there is a small charge so please enquire when choosing plants or large quantities of compost etc. We enjoy advising customers about our plants, and where best to site them in your garden, plus pruning tips etc. Please ask for advice and we will happily walk around the nursery with you, but we will also leave you to browse if you'd prefer that. We don't make visits to gardens to advise nor do we draw up designs or plant gardens. We are members of the Horticultural Trades Association and can sell and accept the National Garden Gift Vouchers. We also accept the National Garden Gift cards. Windmill View also has its own range of gift vouchers to be redeemed here. We sell Thaymar Ice Cream, locally produced at a farm just the other side of Retford. Also we have Magnums, Cornettos and lollipops so you can browse the plant centre whilst indulging in a treat!